My reaction to watching this episode all the way through and seeing the previews for 22? Facepalm. Let me tell you, that hurt. My poor forehead was red for awhile. Just when I thought there was a faint GLIMMER of hope, it was completely smashed. Sure, I can still get the ending I want, but the more they prolong Tian Ze’s and Jing Jing’s selfish love, the more irritated I get and think that Ren Wei and Ai Xing should just give up on them and be together. Grrr. Ah, so I’m apologizing early as I will probably be very negative in this post as I am really annoyed and frustrated right now. Horrible pacing, some horrible writing…ah, there was promise, what happened to it? The perfect song for this series? Google the English lyrics. It works. And just who is heading towards love? Ai Xing and Tian Ze? Ren Wei and Jing Jing? Or the eternal couple that just refuses to DIE? I don’t know. So Ai Xing meets Tian Ze who is hovering at the office in hopes to clear up all his confusion after reading over the Mei Ze case files. Poor Ai Xing, who is still reeling from her argument with Jing Jing completely snaps at the [somewhat] innocent Tian Ze. Before, before, before. You want to know what happened before so badly? So no matter how hard I try now, it’s useless because I don’t have a past with you? Fine, you want to know about the past so badly, go look for it, don’t come to me. The next morning when AI Xing goes to leave for work, there sits Tian Ze at the breakfast table sleeping. He has prepared breakfast for her and an apology. Ai Xing reads it and you know she’s touched, but she’s still very…vulnerable? hurting? from her fight with Jing Jing, so she sets the note down and walks off just before Tian Ze gets up. He straightens everything around and looks for Ai Xing and realizes she has already left without eating or taking the breakfast. Just what did he do wrong? Tian Ze then puts in a all to Jing Jing who rushes out of her own house without breakfast so that she can meet with him only to find him worried over AI Xing not eating breakfast. Jing Jing then thinks for the UMPTEENTH time if maybe she should move on or not as Tian Ze loves Ai Xing deeply now. What an idiot. Oh, and while this is going on Mrs. Meng finds out that her best friend Hui Mei and Ai Xing’s mother is the one the same. Ai Xing, thanks to her determination with Mrs. Liu, ends up selling 10 units in a one go! This earns her much kudos. It’s also because of this that Mrs. Liu recommended Ling Li to a headhunter in China! Jing Jing comes with the breakfast and Ai Xing doesn’t really want to go with her, but she does. Jing Jing tells her that you shouldn’t go to bed angry and that Ai Xing should make up with Tian Ze already. Jing Jing also wishes to make up. Ai Xing takes the breakfast and then goes down to Tian Ze and they have their awkward makeup session in which they didn’t really make up, but whatever. Tian Ze then makes AI Xing promise to tell him what’s bothering her instead of letting everything build up. Ren Wei comes up and wonders why Jing Jing puts herself through such bad situations. Um, well, is this a good time to say its Jing Jing that causes them? Anywho, Jing Jing spouts a line about habits. Ren Wei takes it to mean that her love for Tian Ze has become a habit, but Jing Jing is saying how habit can become love. Don’t say it! Why? Because that will give Ren Wei hope and then you will squash his poor little heart again. Take another little piece of my heart, I know you will. ’Cause you know you got it if it makes you feel good. Sorry, I couldn’t help it. I really, really couldn’t. I mean, that’s how I fell this love square is going. Tian Ze will break Ai Xing’s heart and Jing Jing will break Ren Wei’s. Why? Because when put together, those two can only see each other. They have a very selfish love that hurts not only themselves, but the people who love them the most. So, after trying to act the cupid, Jing Jing sets out to decorate Tian Ze’s new home. This really, really makes Ren Wei happy. I mean, he’s like innocent Tian Ze happy. In fact, amnesiac Tian Ze and in love Ren Wei are really a lot a like. He’s so happy he goes out to buy a rose for Jing Jing. She doesn’t look to impressed when he brings it back, though. He searches for the perfect vase and puts it on the table. He then tries Jing Jing’s noodles (ye gads the girl is attempting cooking yet again)(. Ren Wei says its bland, but he is really touched because she was the one who made them for him. Awwwww. Jing Jing should know I’ve very happy she’s willing to do these things for me. She should, but I don’t think Jing Jing really understands just how much Ren Wei likes her and just how much he loves her kindness and interest (if she ever shows the slightest bit to him). I think this is Jing Jing actually trying, but the thing is, the girl never tries for long before her focus goes back to Tian Ze, Tian Ze, Tian Ze. Get over him already. You have a reformed man who’s head over heels for you. At Ai Xing’s, she gives the hardworking Tian Ze some instant noodles an then scolds him for forgetting meals while he was concerned when she skipped them. Tian Ze takes the noodles and starts to dig in when Ai Xing gets a phone call. She goes to answer it. It’s Ling Li. She goes off and Tian Ze opens an envelope with a thumbdrive. He puts it in his computer and it contains all these lovey-dovey photos of him and Jing Jing. Where did this random USB drive come from? If it was his, why would it be in the case files he was going over from his dad’s office? This leads Tian Ze to his blog which is all about his love for Jing Jing and the goings on of his life. Carp. He rushes to ask Ai Xing, but she’s nowhere to be found. He then sees her diary open on her bed and he reads it and learns that she is just substituting for Jing Jing. Oh, no. Well, this can go one of two ways. Which way do you think it will go? The next morning Stalker Tian Ze returns! Didn’t you miss him? And who’s he stalking? Why Jing Jing of course. Ai Xing and Grandpa Du go to help out at Da Chuan’s house while he and Zhi Xing work on their paintings. This is Ai Xing’s way of repaying Da Chuan for his kindness. Grandpa says the name sounds familiar, but he can’t place it. He then comments on how the Zeng siblings and Da Chuan almost look like they are family. In fact, Zhi Xing has quite a lot of the same habits as Da Chuan (talk about a way to OBVIOUS hint there). 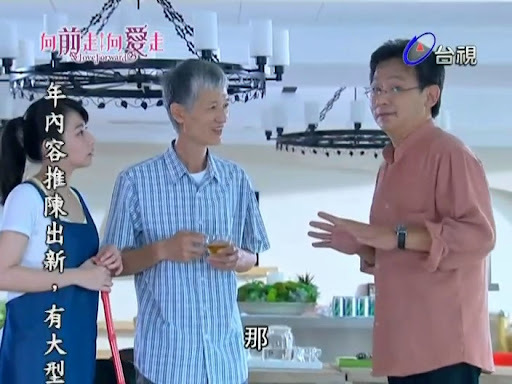 Da Chuan then comes over and says that he has a friend putting on a show who is impressed with Zhi Xing’s work. He wishes to open the show with Zhi Xing. Wow! Ai Xing and Grandpa immediately agree to this and tell Zhi Xing that people will be able to go and look at his pictures on the wall. This makes Zhi Xing happy. Ai Xing then gets a call from Mrs. Meng asking to meet. Mrs. Meng reveals that she is Ai Xing’s mother’s best friend. This shocks Ai Xing. Mrs. Meng then reveals that they both fell in love with Mr. Meng. She quickly assures AI Xing that Mr. Meng is NOT the twins’ father. Since Hui Mei knew that Mrs. Meng was in love with Mr. Meng, she just left the two so they could be together. This made Mrs. Meng feel really guilty as she selfishly kept trying to keep Hui Mei and Mr. Meng apart. What a tragic fate that year later, their daughters become best friends and fall in love with the same man as well. Mrs. Meng begs Ai Xing to not give Tian Ze up. Ai Xing reveals her insecurities, but Mrs. Meng really wants Ai Xing and Jing Jing to compete in love fairly so there is no regrets later. Riiiight. Fair. Actually, Ai Xing would be fair, it’s Jing Jing that would play dirty. Truthfully, I wish Ai Xing would follow Mrs. Meng’s advice. I mean, in the long wrong, the Mengs were not happy in their marriage and it was only as Mr. Meng was almost gone that they began to realize a few things. However, I hold no nope for this trio to not repeat the mistakes of their parents. Back at the apartment things are more and more awkward between Ai Xing and Tian Ze. Apparently after Tian Ze made his great discovery, he hasn’t been talking to Ai Xing. Say what? Grandpa encourages him to apologize as it is always the male’s fault (not always). I think that this really sudden awkwardness is weird. I guess it’s Ai Xing’s fight with Jing Jing plus learning the truth of their parents’ tragic connection and on Tian Ze’s side, he’s just really confused about what to believe—the past or the present, but still. Way too weird for me. Tian Ze then tries to ask Grandpa, but can’t really get anything out. He just finally asks who is real girlfriend is. Grandpa is worried, but somewhat relieved when Tian Ze still says he remembers nothing. Still, Grandpa knows things aren’t right. Jing Jing makes Ren Wei a steak dinner. Ren Wei is impressed at how good it is and Jing Jing recalls making it for Tian Ze. Ren Wei picks up on a weird vibe and asks how she learned to cook it. Jing Jing then happily recounts the story. Ren Wei then gets angry. I can’t say I 100% blame him since he has been trying so hard and does honestly love Jing JIng, however, this is to be expected isn’t it? You chose a woman who was in love with someone else and then used her family and money troubles to get her to marry you. He’s not innocent in all of this. Why couldn’t he realize he liked her before he enacted his revenge scheme? Jing Jing seems rather surprised by Ren Wei’s reaction. Again? Oy this girl really is stupid when it comes to relationships. Although, didn’t Ren Wei say she didn’t have to act in front of him when the two went to visit the countryside and the recovering Tian Ze? JJ: “Mind? You mind that I mentioned him? The exhibit comes around and when the glory should be on Zhi Xing, we get our love triangle (can’t really say it’s a square because no one actually likes Ren Wei in that way, poor guy. To be a true love square you have to have conflicting emotions betwixt all four of them and we just aren’t getting that) acting awkward to no end. Seriously? It seems way too weird to do this so suddenly even though I get why. Everyone senses the awkwardness and tension. Da Chuan points out there is no chemistry and Zhi Xing agrees and tells him the whole story. Ai Xing loves Tian Ze but Tian Ze loves Jing Jing who also loves Tian Ze, but it’s Ai Xing who’s dating Tian Ze now. I feel the OTP has just been forever jinxed. Zhi Xing asks Tian Ze what is his favorite painting and Tian Ze wonders how you know. Zhi Xing explains that it’s the one you keep coming back to to look at. Can’t that change? Yes, it can change depending on moods and the time. Tian Ze takes this in and seems happy. So love can change. So just when I think it’s safe to jump for joy, nope. Why? Because his eyes do their own private tennis match between Jing Jing and Ai Xing. I thought he was happy as it meant that he loved Jing Jing once, but that love can change and now he loves AI Xing, so she’s the one he wants to be with, but at the end, his glance goes back and stays on Jing Jing. I wish to use every expletive I know, but I won’t. Meanwhile, the Zengs and Dus (minus Lawyer Du) go back to Da Chuan’s place for dinner and to celebrate. Da Chuan gets drunk and recalls his past love and how he was too late when he figured out what he wanted. He came back and she was gone. She’s probably happily married elsewhere. He looks for her picture and it falls to the floor. Zhi Xing picks it up and says it’s his mother. Grandpa and Ai Xing don’t believe, but it is Zeng Hui Mei! Grandpa finally recalls that Da Chuan is the chump who got Hui Mei pregnant and left her high and dry to go to the US. Before anything else can be said, Da Chuan passes.out. Saw that one coming. Not the passing out, but him being the twins’ father., especially after Mr. Meng was taken out of the running. Zhi Xeng was so cute when he turned to Ai Xing and said he had a daddy now. After telling Ai Xing the story earlier, Mrs. Meng finally tells Jing Jing. She also tells Jing Jing something else that made me very happy—give up Tian Ze. Earlier in this series, I wanted her to stop interfering and let the two be together. Now, I’m happy she’s telling Jing Jing to give up. Mrs. Meng says that she isn’t saying that out of guilt and as a way to make amends for the past. She’s saying this as Tian Ze is with Ai Xing now and loves her. Jing Jing points out that this is ONLY because Tian Ze doesn’t remember their love. Ouch. A slap in the face to her best friend. And the funny thing is, Meng Jing Jing thinks about how it’s Ai Xing who knows her and understands her the best. She can’t lose such a friend. But if she persists in her selfish love, she will lose Ai Xing because Ai Xing, even being who she is, won’t be able to stay as the third wheel anymore. Yeah, and Ren Wei goes home to his empty place and looks at the dying rose. Just what is he doing? What is he trying to force? Good questions, Ren Wei, good questions. Jing Jing, I know you’re hurt. I understand. I know you lost a lot for the sake of our family, but I can only say I’m sorry. …There are too many unexpected things in life. The past are memories. The future is wishful thinking. Holding on to the present is the only reality. LOVE that quote from Mrs. Meng! Tian Ze and Ai Xing head home after visiting Hui Mei’s grave. Ai Xing talks about how she always dreamed of having a dad, but the truth is that he’s a complete stranger. It’s Grandpa who is more her family than Da Chuan as Grandpa was there for her and gave her love. So I can’t help but think…is blood more important than the people you’re with everyday? Don’t they say nurture is more important than nature? So I was thinking the relationship between father and son is not about blood, but the days you can laugh and cry with each other. Like Grandpa. You have to be happy, too. Because I want you to have the best and most beautiful life. Tian Ze seeks out Jing Jing for the truth about the relationship square. Jing Jing is happy thinking he finally remembered their love. Tian Ze then deflates her bubble by saying he’s studied the Mei Ze case, seen pictures, read his blog, and pretty much pieced things together from that. He also reveals that he found a loophole to get Jing Jing out of marrying Ren Wei if that is what she wants. Jing Jing, upset that he still can’t remember, turns this offer down and goes to leave and then TIan Ze asks what about their promise to each other. In the words of Homer Simpson, “D’oh!” Tian Ze then talks about how he loved Jing Jing once and doesn’t know why, but he loves Ai Xing now. Okay, so yeah, he chooses Ai Xing, right, right? WRONG. If everything is the truth [in reference to his and Jing Jing’s past that is, not his and Ai Xing’s fake past], then we should be together. But can we still be together? Oh, TIan Ze, you did NOT just ask Jing Jing that question. 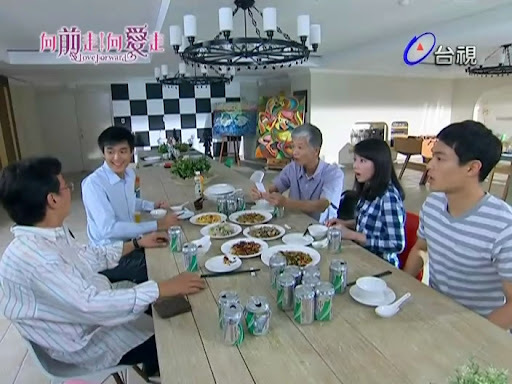 Tian Ze then gets a call from Grandpa about Ai Xing and that’s where we end it. It actually looks like Zhi Xing and Ai Xing might be parting ways, too, but if Ai Xing went to the states with Da Chuan, wouldn’t Zhi Xing? Pulling hair out in frustration. This is NOT where I was hoping this episode would take us. Curse this drama. Please, please no 11th hour ending where Tian Ze realizes his mistake and goes to find Ai Xing. Haha I cracked up when you said “stalker Tian Ze” . It’s SO TRUE! I also cracked up and nodded in agreement at the “blasted fake ceremony”. Heheheh. I’m so fed up with this drama, I don’t even know anymore. Hmm I never thought about how Ren Wei will be all alone without Ling Li now. Plus if Ai Xing leaves for America, Ren Wei really will be all alone. Ahhh I don’t want Ren Wei to have no one!!!!! Actually I just want him to get together with Ling Li, but I doubt that’ll happen. I’ve impressed myself with sticking with it as I am so frustrated and find myself complaining more and more. A lot of times, I tend to drop such dramas and stop recapping them, but I vowed to see this through to the end. And now that it’s soon to be 22 episodes later, I wonder if we get the crappy ending (to me I really don’t want TZ and JJ to be together and AX to go off as the supreme sacrificer with her and RW the most hurt out of the whole ordeal) that the previews seem to show, if I will feel I’ve wasted 22 hours give or take of my life watching this series. Sigh. I watched the 20+ episodes of Breakout. Sure it was cheesy and the plot was ridiculous at times, but there was promise. There was! And then the ending. Oh that ending. It made me really regret sticking through and watching the entire series. I’m hoping that what ah man said on your site is right and we can *maybe* get that good ending we’ve been craving. Heh after watching those painful previews I feel a bit discouraged. BUT WE MUST STAY STRONG ‘TIL THE END! I’m hoping everything will work out fine! I think we’re going to get a crappy ending.